The Kindle Fire, Amazon's hot rod e-reader, had an astounding 54 percent of the Android tablet market just four months after its release. No one else was even close, according to a report by comScore, a digital market research firm. A ConsumerAffairs analysis of about 940,000 consumer comments on Facebook, Twitter and other social media finds a similarly meteoric rise in net sentiment, with a positive rating of 72 percent last month. 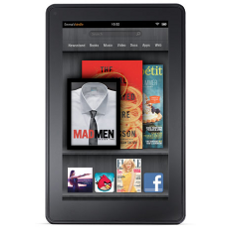 What does the Kindle Fire do? (Reuters) - Amazon.com Inc's stellar quarterly results are helping convince skeptics on Wall Street that a bout of intense spending is beginning to pay off for an Internet retailer trying to transform itself into a technology company. Shares in Amazon leapt 15 percent on Friday after it reported first-quarter earnings and margins well above investors' most bullish expectations, tacking on some $10 billion in market value and marking its biggest single-day gain since October of 2009. CEO Jeff Bezos has tried to convince investors to stick with the company for the long term as it flirted with losses in recent quarters. He is trying to transform Amazon from an online version of a big-box retailer like Wal-Mart into a provider of technology services.